• Fresh Dog ™ Dry Shampoo: If you’ve ever used a dry shampoo on your own hair, you know it works by absorbing the oil and dirt from your scalp, leaving your hair looking like it’s just been washed. Fresh Dog's dry shampoo does basically the same thing for your dog. It is a loose powder that you sprinkle directly onto your dog's coat for an instantly clean and freshen appearance. When applying the product, I found it best to sprinkle a small amount at a time, as using too much at once can cause a cloud of powder. I started at the base of the neck, sprinkling a bit of powder and massaging it in. I continued adding a bit more powder as needed, working my way down the back. 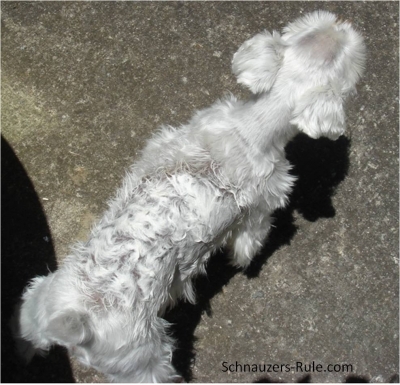 A little powder goes a long way and my Schnauzer really enjoyed the massage. Note: I did not apply any product to the face, just to the body and legs. When I finished applying the product to the areas I wanted to cover, I took a soft bristle brush and brushed my dog out. This helped to distribute the powder even further and removed the excess along with small bits of dirt. I actually applied the powder to my dog while in the backyard. Since it was my first time trying out this type of product, I wasn’t sure if the process would be messy or not. It wasn’t. I did notice that my dog’s coat appeared whiter, so dogs with a black coat might need a bit more brushing. The dry shampoo powder is easy-to-use and smells, well… fresh! The powder is infused with essential oils and has a marvelous lavender rosemary scent. 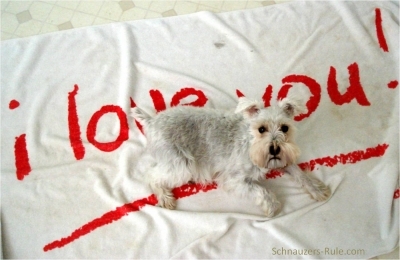 I even deodorized my Schnauzer’s dog bed by sprinkling some onto it, too. It just smells so good. The dry shampoo powder is a good product to use as a quick way to remove odors and freshen up your dog's coat. • Fresh Dog ™ Waterless Foam Bath: If your Schnauzer is in need of a bath but you just don’t have the time to do it, this waterless bath foam will solve your problem. Why it’s a bath in a bottle and no water needed! Just dispense a few pumps of foam in the palm of your hand and distribute over your dog, taking special care not to get any into the eyes. 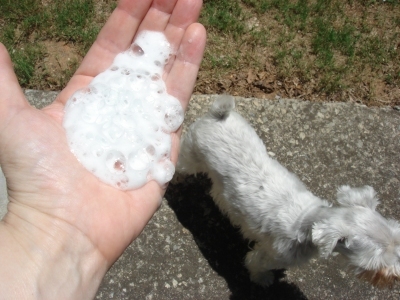 Massage the foam fully into your dog's coat to loosen and break away any dirt and oils. Then towel dry your dog off... That's It! My Schnauzer did not object to the foam bath at all and in fact, pranced around like "I got it going on" when we were done. I think he was just as happy as I was that he was clean and smelling fresh. I really like this product. There was no sticky residue and it smells great. I've tried squirt-on waterless shampoos before, but this foam bath is way better. The foam is thicker and richer and distributes the cleaning agent much more effectively, so you end up using less of it. note: Although it is a waterless shampoo, the foam itself does dampen your dog's coat, but you do not need to rinse it out. Just allow the product to do its magic. Once you towel dry your dog, it dries quickly and leaves the coat super soft and smelling great! I loved it! Your dog hates regular baths but could really use one about now. Your dog has been sick or is recovering from surgery and could use some spot cleaning. You have an older or arthritic dog that has a hard time getting in and out of the tub. You have company coming over and just no time to give your dog(s) a regular bath. You have a multi-dog household and regular bath day becomes an all day job that's a nightmare. It's great for cleaning dogs during those cold winter months. It's a great product to carry along on trips or outings, just in case your dog gets into a smelly situation. It's safe for dogs and puppies over 6 weeks of age. For those who normally bathe their dogs at home: This no mess, no fuss, no back-breaking foam bath is easy to do and allows you to put off having to give your dog the traditional bath so often. For those who usually take their dog to a groomer: Extends the time in-between regular visits to the dog groomer, thereby saving you time and money $$. So for a great alternative to regular shampoos and the dreaded task of giving your dog a bath, try Fresh Dog ™! It will leave your dog's coat smelling fresh and clean. 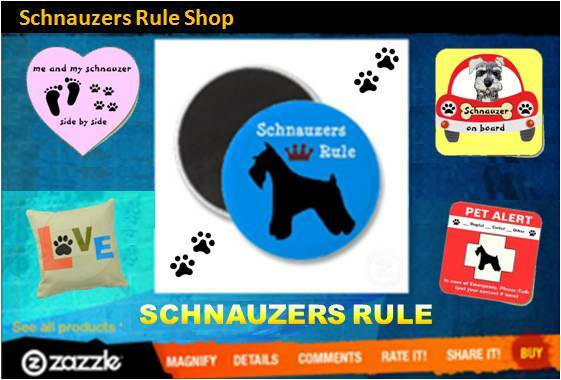 How would you like to try out Fresh Dog on your Miniature Schnauzer... for FREE? Thanks to the good folks at Fresh Dog, one lucky winner will win the set of shampoos to freshen up their own dog(s). Prizes: The Happy Dog Bundle - Both innovative dog shampoo products which include (1) 12oz dry shampoo powder and (1) 6oz bottle of the waterless bath foam. A $27 value. Just post a comment below, like: I want a Fresh Dog! A winner will be chosen at random from those who post a comment below on Friday May 18, 2012. So post a comment and Good Luck! And the winner is....... Fern Williams! An easy-to-use deodorizing powder for dogs that extends time between regular washings. No water needed. Why it's a dog bath in a bottle - No water needed! No sticky residue, repels dirt, and dries quickly.